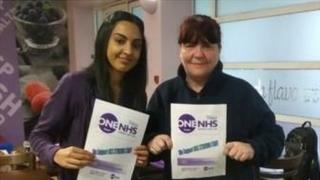 Cleaners, catering staff, porters and security guards at Liverpool Women's Hospital are to go on strike over pay. More than 40 staff members employed by OCS are expected to walk out on Monday after all UNISON union members there voted in favour of strike action. The union says OCS, who have been contacted for comment, pays some staff the national minimum wage of £7.83 per hour rather than the £8.93 NHS minimum. The trust says it has plans to ensure services will not be badly affected. Single parent Stephanie Mahoney, who is employed by OCS at the Liverpool Women's NHS Foundation Trust, said it was a "real struggle to cope" on the lower rate. She added: "I sometimes work alongside colleagues who are paid £9 an hour, but we're doing the same work. "Colleagues are very supportive of us taking action to get this sorted out because they don't think it's right that we're on lower pay than them."